With a creative beat of the drums, the VOK DAMS team in Hamburg staged the “World Dealer Conference 2016” for the Spanish automobile manufacturer SEAT. 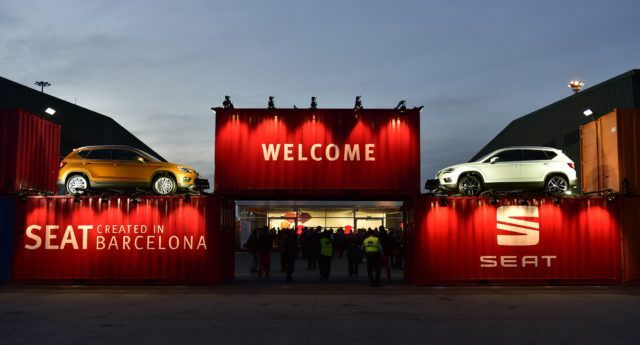 An atmospherically lighted setting at the car shipping port in Barcelona had 2,400 international dealers look highly motivated and with maximum emotion into a promising future. Behind them lay five hours of an unique SEAT and Barcelona experience. Following the motto “SEAT – Created in Barcelona” the dealers were taken to this exceptional and surprising location: the very place, where the vehicles, which are produced in Martorell (headquarters of SEAT) are then transported by ship into all countries of the world. Quasi the “gate to the world” for the brand SEAT, in one of the most creative cities of the world. The emotional experience was divided into two parts– first, a product-and-brand-show, presented by Luca DeMeo, the new CEO of the brand, and his executive committee colleagues Dr. Andreas Offermann and Dr. Matthias Raabe. Here, dealers were sworn in onto the new course of the brand, which can be summarized in short as “Most Creative Simplicity”: design-oriented new models, which are targeted at and designed and developed for the requirements of a young, dynamic target group and technological innovation and mobility concepts for the urban living environments around the globe. All this was presented in a colorful and diversified manner, in the format of a fashion show, as known from the fashion and design metropolis of the world. Following this, dealers were immediately taken to the evening event, which, just like the product and brand show, followed the motto “Created in Barcelona”. In a small format, the best and most creative restaurants of Barcelona were brought together in a culinary experience world. Here, the star chef prepared culinary delights alongside a tapas bar and vegetarian soul food was prepared next to the best burger from town. All accompanied by the Urban Club Band, which ensured the well-known Barcelona clubbing-feeling. This task was truly a challenge. With a mere four months for preparation and planning, a location, which was not much more than a roof over the vehicles at the harbor, a business meeting with highly sensitive and absolutely top-secret innovations, with 2,400 guests, who stayed in 26 hotels, a unique and extremely complex catering concept and a light-, sound- and video staging of the brand, which was able to compete with every fashion show by Victoria`s Secret.